Second Public Art Bronze Sculpture! to have a traditional bronze sculpture gracing its downtown area. Now Orland is ready to lead again! Our second Public Art Bronze Sculpture, titled "Our Hope and Heritage" continues the historical theme of the first Public Art Bronze located on Fourth Street. 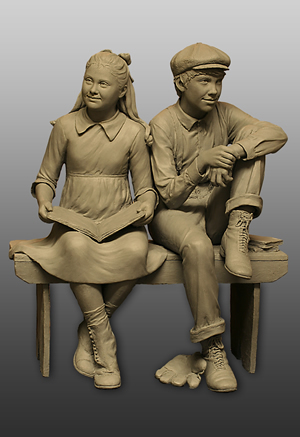 This second LIFESIZE sculpture features two young children dressed in the typical clothing worn by school children in Orland's early days. It will grace the Centennial Park area as you enter downtown Orland from the west. This beautiful bronze is being created by Orland's own sculptor, Tamara Bonet, who is already gaining national prominence. In gratitude, your tax deductible donation will ensure that your name or the name of your group will be inscribed permanently on a large bronze plaque installed beside the completed sculpture for all future generations to see. A special reception for the donors will be held at the Orland Art Center Gallery. This is your opportunity to be a permanent part of this beautiful tribute to Orland's Proud History!